Maspolomas holidays offer a relaxing break with a guarantee of sunshine throughout the year. Although an upmarket resort, we have a surprising range of cheap Maspolomas holidays. 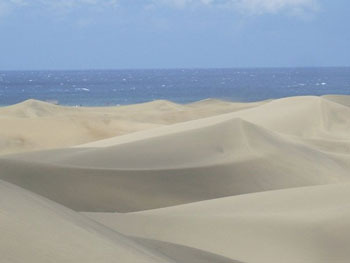 Here, on the south coast of Gran Canaria, you can enjoy undulating sand dunes and a variety of water sports. With many local attractions and recreational facilities, holidays to Maspolomas provide fun and entertainment for all the family. So if you are looking for a relaxing break with winter sun, check out our holidays in Maspolomas and you could soon be on your way. Explore the dunes on camel back, play a round of golf, go deep sea fishing and dolphin spotting, or simply relax by the pool; the choice is yours. With six kilometres of beach, it is always possible to find a secluded spot in the dunes which is why it is popular with naturists. Search our selection of Maspolomas holiday offers and you will surely find one to suit your interests. Great accommodation, superb restaurants, lively bars and clubs are just a few of the reasons why you should surf our last minute Maspolomas holidays. So grab yourself a bargain Maspolomas holiday by searching now.